Wow, Alejandro González Iñárritu really doesn’t know how to portray happiness, does he? This is yet another solemn film from this great director. I think this is his darkest one yet! This film was really bleak. I kept waiting for a glimmer of hope or joy, but the film just wouldn’t let up. I really respect that about Innaritu, as he decides the tone of the film and has the balls to carry it all the way through (unlike uneven films such as “Love And Other Drugs”). 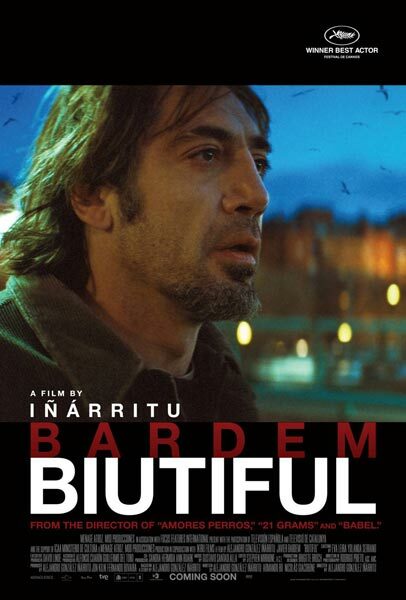 I must say, Javier Bardem’s performance was definitely Oscar worthy. He brought me to tears. The gritty cinematography also added greatly to the dark tone. The film is a great character study (and not just for the lead character) and I think it would be even more rewarding after a second look. I don’t think I can put myself through that depression again though. Don’t watch this film if you are going through a rough patch in your life. It will probably make you feel worse. MOVIE OF THE WEEK: E.T.